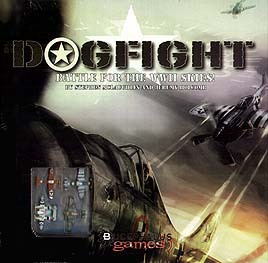 The sight of your wingman flying behind you, the sun at your back, the enemy helpless in your sights: feel the rush of aerial combat in this quick, engaging World War II combat game. Many of the great battles of WWII were decided from the air. Can you outmanoeuvre your opponent and blow them out of the sky to secure victory for your side? Or will you curse them as you crash and burn? This lovingly crafted game is beautiful as well as functional. The wooden board will withstand many hours of play and the die-cast, hand-painted metal planes are custom molded to be the most realistic, historically accurate planes available. With a wingspan of more than 1.5 inches (38mm), each plane is a work of art... even as you shoot it down.